The Dr. 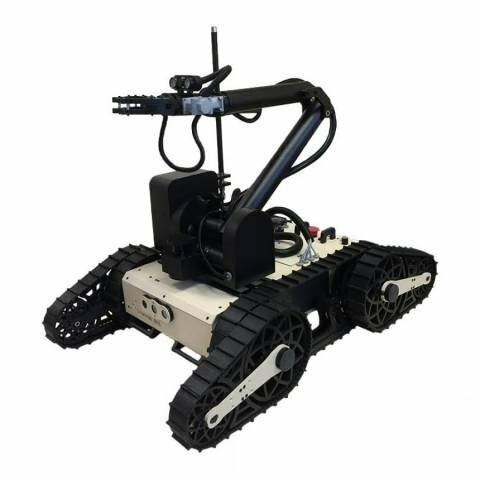 Robot Jaguar V6 Tracked Mobile Platform w/ Arm is designed for indoor and outdoor applications requiring robust maneuverability, terrain maneuverability and object manipulation. It comes with four articulated arms and is fully wirelessly 802.11N connected. It integrates outdoor GPS and 9 DOF IMU (Gyro/Accelerometer/ Compass) for autonomous navigation. Jaguar V6 with Manipulator Arm platform is rugged, compact, weather and water resistant. It is designed for extreme terrains and capable of stair or vertical climbing up to 300mm with ease. The 4 articulated arms could convert the robot into various optimal navigation configurations to overcome different terrain challenges. The integrated high resolution video/audio and optional laser scanner provide remote operator detail information of the surrounding. Besides the ready to use control and navigation software, a full development kit including SDK, data protocol and sample codes, is also available.